I used to think that all bread and butter pickles were neon green and overly sweet, which is why — for a significant portion of my life — I didn’t like them. That all changed a few years ago during a trip to The Girl + The Fig, a fantastic little restaurant in Sonoma, California. I ordered the top sirloin burger with brie (one of the best I’ve ever had), which was served with a pile of matchstick frites and their homemade bread and butter pickles. I remember how fresh and crunchy they were, with just a hint of sweetness. I wish I could get my hands on their recipe, but in the meantime, I’ve created my own. Pickling is actually very easy — vinegar, sugar and a selection of spices is pretty much all you need. I adapted part of my pickling method (the salt and ice) from Smitten Kitchen, but the rest is pretty standard. 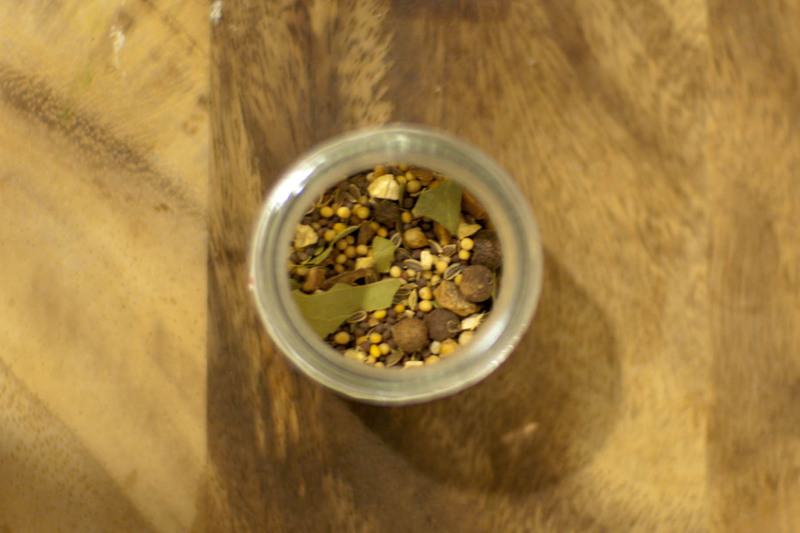 The traditional spices include mustard seed, coriander seed, and tumeric, but I like to use the pickling spice from Penzey’s which contains yellow and brown mustard seeds, dill seed, cloves and crushed red pepper (among other things). Come summer, when the farmer’s markets are in full swing, I tend to always have a batch of these on hand. They’re so good with burgers and all that other delicious cook-out food, plus they’re so much better when you make them yourself. 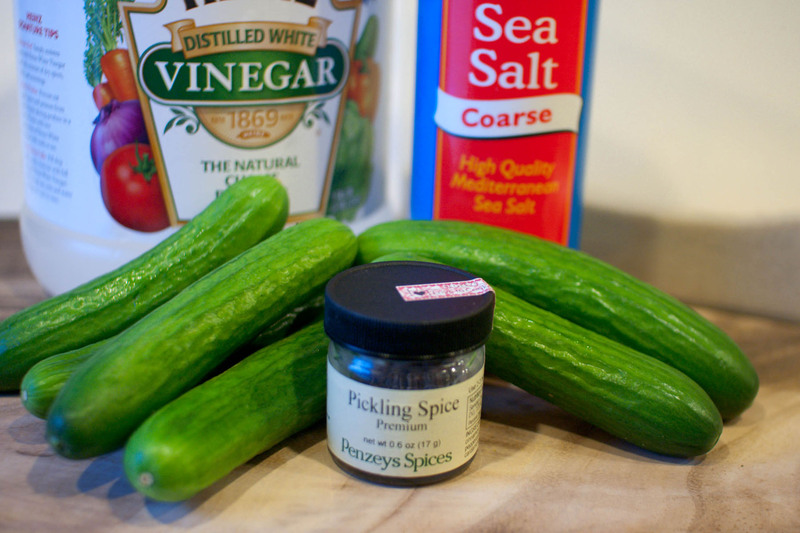 In a large bowl, toss the sliced cucumbers with salt. Cover the bowl with ice and let sit for two hours. In a medium sauce pan, bring sugar, vinegar and spices to a boil. 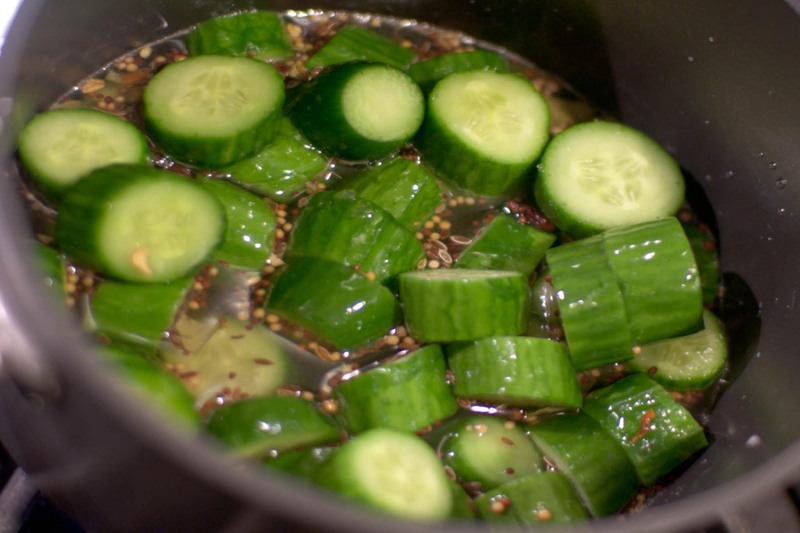 Add sliced cucmbers (drained of melted ice). Once the vinegar/sugar mixture returns to a boil, immediately remove the pan from heat. Let pickles cool before jarring and storing. They’ll begin to taste picked within a few hours. Can be stored in the fridge for up to 3 weeks. Love pickles – yours look great. I think pickling has a reputation…for some reason I have it in my head that it’s too difficult/too much work but clearly you have shown that it isn’t at all! And the result seems much better. 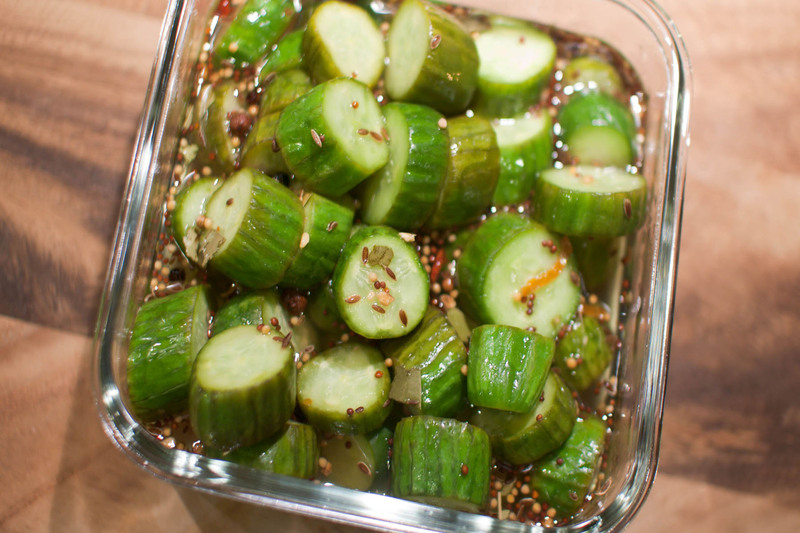 I need to find some good cucumbers so I can make these! Ah, makes me think of summer. Can’t wait! Great job on the pickles. I just wanted to key you know I am a huge fan!!! I love your blog! And your pictures are beautiful.